Hi everyone! It's Wednesday, and today I have an I Am My Hair card!!! I cut the largest size of this Spellbinder Scallop Circles, but I folded the card stock and off set the die and then cut it so it folded into a card (video tutorial on how to do that very very soon!) I cut the smaller one in a like a peach, and then I inked it with Worn Lipstick, Spun Sugar, and Victorian Velvet to get the color. 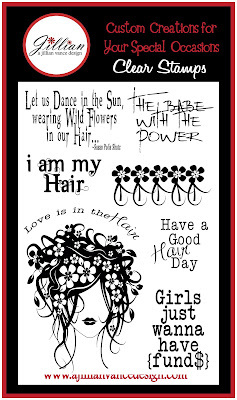 The I used the I Am My Hair lady stamp found HERE in Magenta Hue archival inks. Then I added ribbon and a Pear Pin by A Jillian Vance Design found HERE. Thanks for checking out my card. Purple over I am my Hair!!! Leave me a comment, follow this blog and "fan" us on Facebook! Awesome stamp set! I see art is in your present and definitely will be in your future...in some form or another. Keep up the good work but most of all, have fun along the way. After all, it's only ink and paper! What a fab stamp set. ooohhhhhh this one is awesome and is going on my wish list...... and the purple card is rad. Love it.